There are a lot! My favourite is above, look at its adorable fat rolls! In addition to iconographic representation the hippo provided much of the ivory within the collection: this painstakingly intricate ibex vessel is carved of hippo ivory, the head is made of one complete piece of ivory (Petrie, OoDU, 43). 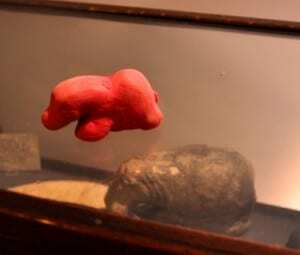 Extracting ivory from a hippo would be no easy task, these creatures, although seemingly flabby, can move rapidly in water and on land, and were considered one of the more ferocious creatures of Ancient Egypt. In mythological form an upright, pregnant hippo was the manifestation of Taweret (meaning she who is great), a protective deity linked to birth and the afterlife. No doubt British soldiers spotted hippos during the Boer wars, however prior to this there was an Egyptian hippo celebrity already in the heart of London. 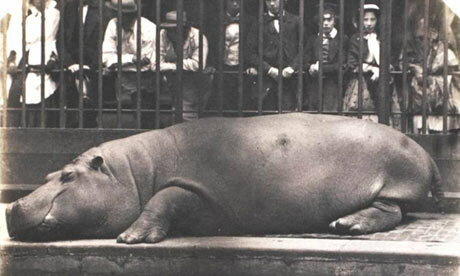 Obaysch was transported from his Nile home to Southampton in1850 and arrived at his London Zoo home on May 25th. He proved an instant success attracting more than 10,000 visitors a day and inspiring a host of memorabilia. He was eventually provided with a partner hippo-ess who in turn gave birth to a son named Guy Fawkes. Obasych was named after the Nile island upon which he was found, however his offspring is given a ‘celebrity’ English name. 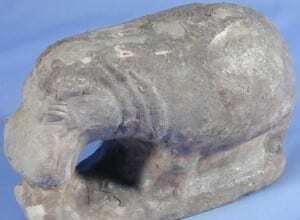 The animal had been absorbed into English heritage and history even, had it perhaps lost its Egyptian origins? The same questions can be asked of the Ancient Egyptian hippo pieces, we had one masterfully re-invented by a young visitor, and Petrie himself recast these objects by applying numbered titles to them. Through the rather rotund and distinctly zoological theme of a hippo a more prevalent practice becomes apparent in the archaeological world: the taking of the exotic and pushing a British lens over it. Perhaps a theme I will discover in the other animals of the collection? Well, so far we have one animal bobbing around in our menagerie, I counted at least 4 hippos on display in the museum, and there exists an uncounted amount no doubt made of hippo ivory. But, I feel the legacy and path stomped down by Obaysch and his sojourn at the London Zoo would have no doubt made these pieces instantly recognisable, and perhaps family favourites of any visiting Victorians. Next week I shall be looking at beautiful gaming pieces and how they relate to English heraldry (you can try and guess which animal that is, I will give you a clue: there are no unicorns, as far as I am aware, in Egypt). Spot the dog, Madagascar, The Coco Pops commercials, Hungry Hungry Hippos, etc. 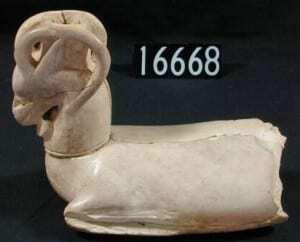 The Egyptians certainly were highly skilled craftsmen, to get a carving like the ibex from one single piece of ivory is certainly an achievement.